Republican congressional baseball coach Roger Williams hit infield practice Wednesday morning as Rodney Davis played catcher and Williams staffer Zack Barth backed them up around a flooded batter’s box. In the outfield, lobbyist and former Hill aide Matt Mika fielded balls with teammates. It seemed like a normal baseball practice at Eugene Simpson Stadium Park in Alexandria. But it was the Republican team’s first practice since June 14, 2017, when a gunman opened fire at the same field, wounding five. The scars from a bullet wound on Barth’s leg were visible. House Majority Whip Steve Scalise wasn’t with his teammates Wednesday, recovering from yet another procedure to repair the damage from a bullet slamming into his hip. Mika was also severely wounded, a bullet just missing his heart. And off the field, the scene appeared very different than it did before the shooting. At least 20 uniformed Capitol Police officers, a member of the K-9 unit and his German shepherd swept TV and cargo trucks and media bags. Other non-uniformed security kept watch along the outfield fences. Last year’s shooting took place the day before the annual Congressional Baseball Game, which pits Republican lawmakers against their Democratic counterparts. The teams decided to go ahead with the game, as scheduled, and ended up raising a record $1.5 million for charities and selling almost 25,000 tickets. This year’s game is scheduled for June 14 at Nationals Park. Wednesday’s huge media presence to cover the practice had to remain inside a fenced area behind third base and wait for the lawmakers to walk over. “Obviously, the media is different. You’re the only one who was usually out here covering us,” Davis told a Roll Call reporter. The Illinois Republican recalled taking security for granted before the shooting. “I would come in every morning and roused whomever was on Steve Scalise’s detail because they’re just good people and they’d become friends,” Davis said. Capitol Police special agents Crystal Griner and David Bailey, who were on Scalise’s security detail last year and helped take down the shooter, were not present at Wednesday’s practice. Both were injured during an intense firefight with the gunman — Griner was shot in the ankle and Bailey was hit by shrapnel. Georgia Rep. Barry Loudermilk and three other congressmen wore hats bearing the Capitol Police insignia Wednesday. For Loudermilk, the day was about finishing the practice that was interrupted by gunfire last June. He wore the same yellow Kennesaw State jersey he was wearing during the shooting, but not the same pants — they are at his house, he said, still covered in Mika’s blood. “My wife didn’t think it’d be a good idea to bring those pants,” he said. 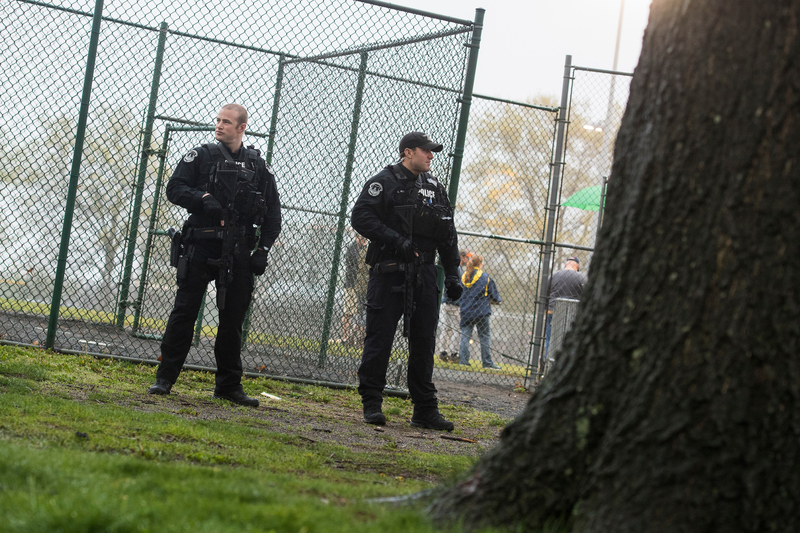 Alexandria police officers patrolled the field Wednesday, while Alexandria Mayor Allison Silberberg came to show her support. 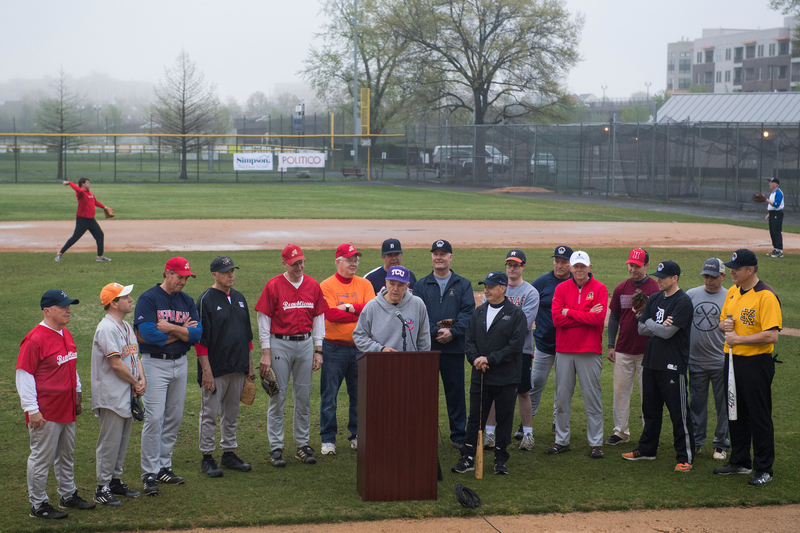 The GOP team has practiced in the D.C. suburb for at least 60 to 70 years, according to longtime team manager Joe L. Barton. The members practiced for about 30 minutes and then held a news conference to talk about returning to the field. Davis recently did an interview with an Illinois news outlet at the field. But for Williams, it was his first time back. “It was a little strange to come back. I immediately went to where I was when I was hunkered down and looked at it, thought about it and moved on,” the Texas Republican said. Like Williams, Barton was ready to move on with practice as usual after the media event. “After this practice, the practices will be about baseball. Today was more about resiliency and commitment and continuity,” the Texas Republican said. In the days after the shooting, lawmakers from both parties said the incident was a reminder to be more civil with one another as leaders of the nation’s political discourse. If they were less nasty to one another on the Hill and the campaign trail, then perhaps Democratic and Republican voters would respect each other’s ideological differences, too. But promises to play nice after the shooting faded quickly. “I don’t think the shooting or the event changed anything politically,” Williams said. This is the last game for Barton and Arizona Sen. Jeff Flake. Both are retiring after this term.